2002 Field Day Information. 2003 Information is posted on the other SBARC web site. The Sierra Blanca Amateur Radio Club (SBARC), Lincoln County Amateur Radio Emergency Service (LCARES) and Lincoln County Radio Civil Emergency Service (LCRACES) will be participating in the American Radio Relay Leagues (ARRL) National Field Day event this next Saturday and Sunday from 12:00 Noon to 12:00 Noon. This event is a training program to insure that each state and local area has trained operators and radio equipment to operate under Tactical Field Conditions during a major disaster event. Part of this years training will cover operations during a major Homeland Defense event. We will be operating under field conditions in tents and with portable equipment, such as emergency power sources, two way satellite and long-range short wave radio networks. We will be operating three stations, two will be used for wide area communications and one will be used to beginner Hams to make long-range contacts. We will use Morse code, Voice and computer digital radio networks. This type of Field Day Operation would be what the Lincoln County ARES or RACES will set up during a long-term disaster event in this area. During such an event we will have more than one type of radio network utilized. One or more local county wide networks and one or two state and region wide radio networks with direct contact with the Santa Fe Emergency Operations Center (EOC) and possible FEMA as well as communications to other New Mexico City or County EOC's. The local Amateur radio teams participate in two nationwide events such as Field Day in June each year with the second event called Simulated Emergency Test (SET) held each October. These events help test equipment and operator training for major disaster events. Most of our local hams participated in our annual fire season here and receive first hand actual experience, so our hams are some of the best prepared and trained in New Mexico. We will began setting up at Noon on Friday, but we will not start the Official Operation until Noon on Saturday, this operation will run 24 hours, so we will be operating all night, but we may not have all three stations on the air at night. Please come visit our operation this next weekend, you do not need to be radio-active, nor a techno wiz, just an interest in emergency services or radio communications. Again please come and visit our Field Day Operation this weekend, we will give you a quick tour and answer any questions you may have. We will be posting information on our Ham Radio Event on our web page with photos. Our location this year will be at Warrior Drive and Hull Road near the new playground, you cannot miss us, and we will have some large antennas installed by Saturday. 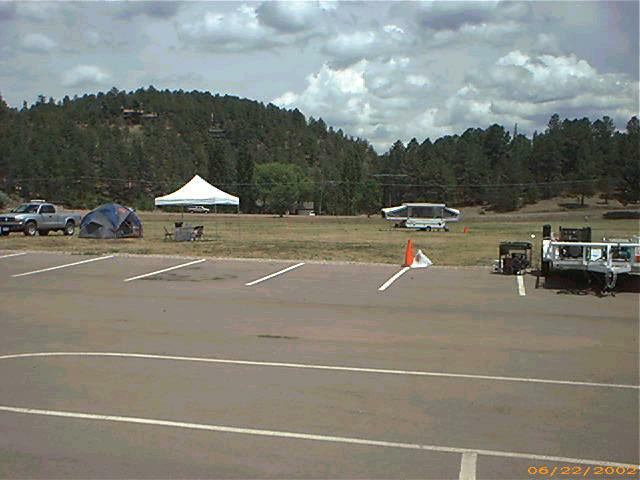 Field Day 2002 Ruidoso NM. See Field Day 1 for more .